Our five best mini ITX cases for small form factor builds will delight with their diminutive size. Small form factor builds appeal to people for many reasons. For some, the balance between portability and power inherent to small desktops offers the best of both worlds: customizable power of desktops and portability of laptops. While SFF builds never reach the heights of either, they fit some people’s lifestyles well. That being said, their smaller scale comes with some of its own problems, like room to actually build and the compounded need for adequate cooling. Don’t worry though, that’s why this list, and the short guide that follows it, exists. If you’re looking for the best ITX gaming case to show off to your friends at LAN parties, or anywhere, then look no further than the H200i. 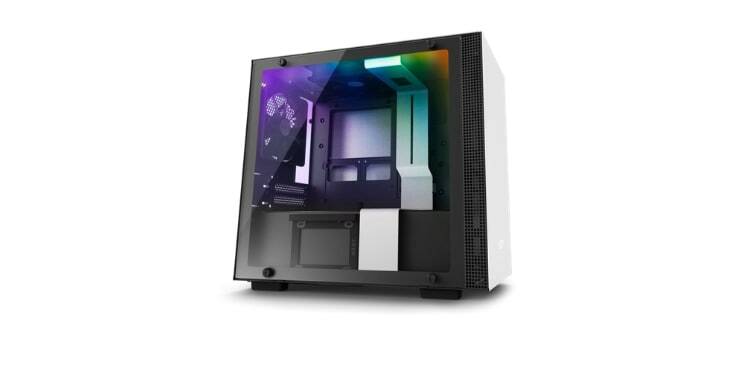 This case comes from NZXT, who is an established name in the case industry specifically, and is known for making great looking and high quality cases. The H200i boasts an all steel construction with a tempered glass window on one side. This case also comes with arguably the best cable management design of any case, especially for a small form factor PC case, thanks to its channels and straps. 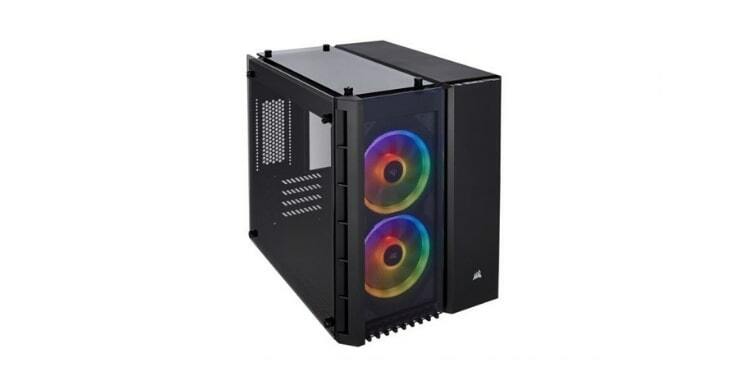 This case comes with preinstalled RGB lighting to make your case shine and show off your hardware through the tempered glass window, as well as two 120mm fans. The case is also compatible with several radiator configurations allowing for ample water cooling, making this a great option for a small gaming PC case. In any small PC case, temperatures can quickly become a real issue. High-end hardware throws off a lot of heat, especially graphics cards. This heat increases the internal temperature of the case very quickly in smaller builds and causes a runaway effect. The higher case temperatures make the hardware run hotter, which heats the inside of the case up more, which causes the hardware to reach even higher temperatures. If you aren’t able to get all the hot air out of the case and replenish it with cool fresh air fast enough, your computer’s hardware can throttle, meaning it will reduce its clock speed to a suitable level that it can maintain without reaching unreasonable temperatures. If you’re looking to cram tons of powerful high-end hardware into a small computer case, we suggest using the Corsair Crystal 280X. This case boasts tons of cooling on the top, front, and bottom of the case as well as tempered glass on the top, front, and side. It can fit up to six 140mm fans for maximum raw airflow, or up to three 240mm radiators for potent water cooling setups. The downside to all of this glass and space, however, is that it is by far the heaviest case on our list at a whopping 16 pounds, which is heavier than some Mid-Tower cases. InWin is a Chinese manufacturer that anyone shopping for a case should consider. They have a well-diversified offering of products that range from highly affordable cases that offer a great value, to very unique and interesting products. The InWin A1 falls mainly into the latter. This SFF case comes in either black or white and has an interesting RGB base that glows any color you want. It also sports a tempered glass window on one side that lets you see your prized hardware resting inside the case. While in many ways run of the mill, this case hides an awesome surprise that makes it worth mentioning: in the top of the case is a Qi wireless charger. This means you can place the tiny case either on or under your desk, drop your phone on it (if it is Qi compatible) and it will begin charging without being plugged into anything. This case also comes with a 600 watt 80 Plus Bronze certified power supply. The major drawback of this case is its relatively poor cooling. It has room for a decent sized heatsink, but can only fit four fans, with some of them placed in less than ideal places that could be blocked by the motherboard or GPU, further limiting your cooling options. If you’re on the hunt for the most portable PC case that’ll let you easily take your desktop on the go without lugging a 15+ pound hunk of metal, then look no further than the Cooler Master Elite 110. This mini PC case is a roughly 10-cubic inch… cube with a protrusion at the back to accommodate the full-size ATX power supply. Despite its diminutive size, the cooling capacity is impressive. It can fit a small 120mm radiator in the front for a little water cooling, or a 140mm fan for airflow. Additionally, it can fit two 80mm fans, one on either side. The sides, top, and front are all made from a breathable mesh to allow for air to easily pass through the case. On top of that, this tiny powerhouse has some impressive options when it comes to storage. It can fit up to three 3.5” drives, or four 2.5” bays, or various combinations of the two depending on your needs. The most balanced configuration sports two 3.5” drives and two 2.5” drives. Of course, in this form factor, there will always be a trade-off. Not all graphics cards will fit into this case, with a max GPU length of only 8.3 inches. Also, water cooling is pretty much a must for this case, since the maximum cooler height is an anemic 76mm. Small form factor builds are notoriously difficult. Squeezing your hands into the tight spaces inside these tiny cases can be challenging, especially when one hand is trying to hold a part in place, the other is trying the screw it in, and your elbow is keeping cables from getting caught up in the mix. The task of cramming everything into the space you’re given can be overwhelming for a lot of first time builders, and even some veterans. However, a case like the Thermaltake Core V1 can help remedy this. This case uses a clever design that allows for all of the side panels and the front to be removed. This leaves you with just the basic frame of the case and gives you more room and angles from which to work. The case also has a nice compartmentalized design that allows you to put the power supply underneath the motherboard and other hardware, which makes cable management much easier. The case has a transparent window, and thanks to the interchangeable side panels this can be placed on the top or either side. Both of the other side panels on the case, as well as the front, are made from a breathable mesh that offer pretty solid cooling performance. What’s even more impressive is that the case can fit a monstrous 200mm fan in the front for maximum airflow. 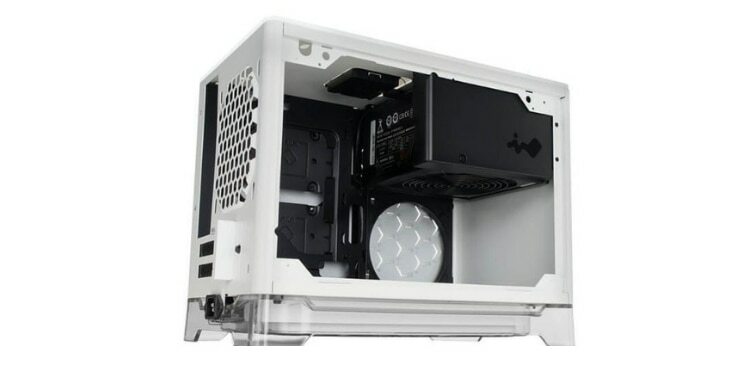 While we always say it’s nearly impossible to pick the best of a given item because defining what’s the best is up to you and your needs, this tired trope is particularly true when it comes to finding the best ITX case. This is thanks to things like cooling and compatibility, which can have much more of an impact thanks to the extra small scale. To help you make sure you’re getting the right case for your needs, we’re going to look at three major factors to consider when in the market for a new mITX case. It seems obvious that size would be a consideration when choosing a case for a small form factor build, but there are several things to look at when it comes to size. Not only do you want to look at the overall dimensions of the case to ensure it will be the size you want, but the graphics card and CPU cooler clearance should also be taken into consideration. Many people will choose a shorter cooler or even water cooling by default when planning a small form factor PC, but if you want to get the most out of your hardware, a bigger cooler is always better. Some of the largest coolers on the market get up to– or even over– 160 mm in height. For coolers like this, the H200i is your best bet. This case can fit CPU heatsinks that are up to 165mm in height. The GPU is the second thing to check in smaller cases. Many cases can only fit graphics cards that are under a certain length. In this regard, a case like the Cooler Master Elite 110 is a poor choice, as it can only fit cards up to 200mm cards. If you plan to use a larger top of the line GPU either the H200i or even InWin A1 are great choices, as either of these can fit up to 320mm graphics cards. Cooling is arguably more important in small cases than in mid-towers since the air in the case can heat up much more quickly and to much higher temperatures since there is a much smaller volume within the case. If you’re going to use high end or notoriously hot running hardware, then make sure your case can fit plenty of fans, has good airflow, and even consider water cooling. For optimal cooling, we suggest the Corsair Crystal 280X. 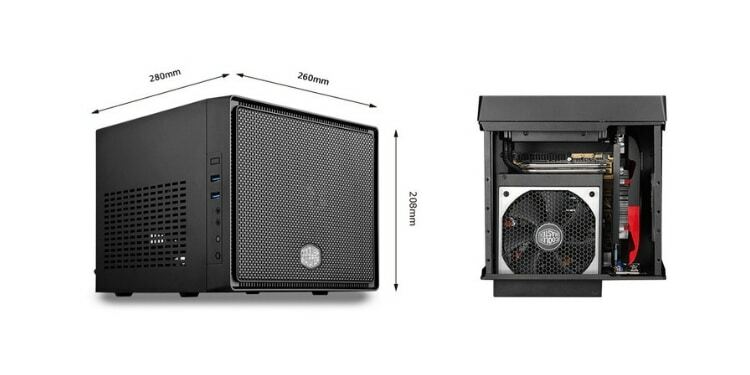 This tiny case has incredible cooling potential and can fit up to six 140mm fans. This many fans can easily replenish the entire internal volume of this case many times per second when under load, which will ensure more manageable temperatures that will let you get the most out of your hardware. Alternatively, you can fit up to three huge 240mm radiators for water cooling. If you have a large library of games, movies, or music, then you know the feeling of running out of space and having to uninstall or delete things in order to free up space. The best way around this is to simply add more drives to your system. However, in small form factor cases space is at a premium, so drive bays can be hard to come by. Generally, there are two kinds of drive bays to look for. 3.5” bays are for standard hard drives which, while slower, usually offer terabytes of space at a good price. 2.5” bays, on the other hand, are for solid state drives, which are much faster and can drastically reduce loading times in games, but cost much more and offer less storage. 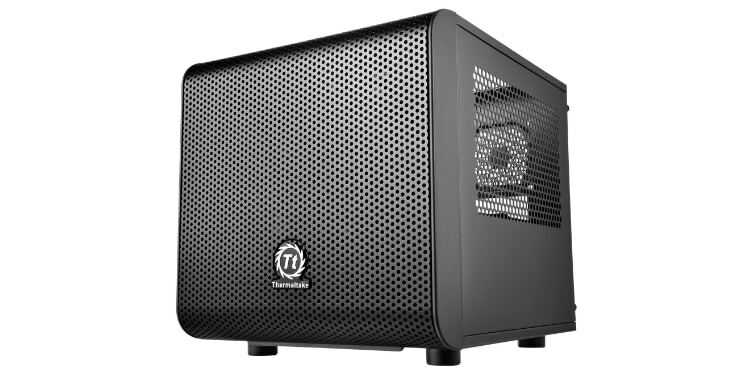 If you’re looking for the most storage possible in your mini ITX case, then take a look at the Cooler Master Elite 110. While this is the smallest case on our list, it can fit up to three 3.5” drives or four 2.5” drives, or a combination of the two. This translates to 6Tb or more of storage with all 3.5” drives.